Students’ classwork is becoming increasingly digital. Whether creating a slideshow, blog post, presentation, or document, images are always needed. Teachers also regularly need images for things like class blog posts, assignments, presentations, and course work. Where do teachers and students find quality free images for their work? Google Images is not a good idea because most images are protected by copyright. However, there are options! 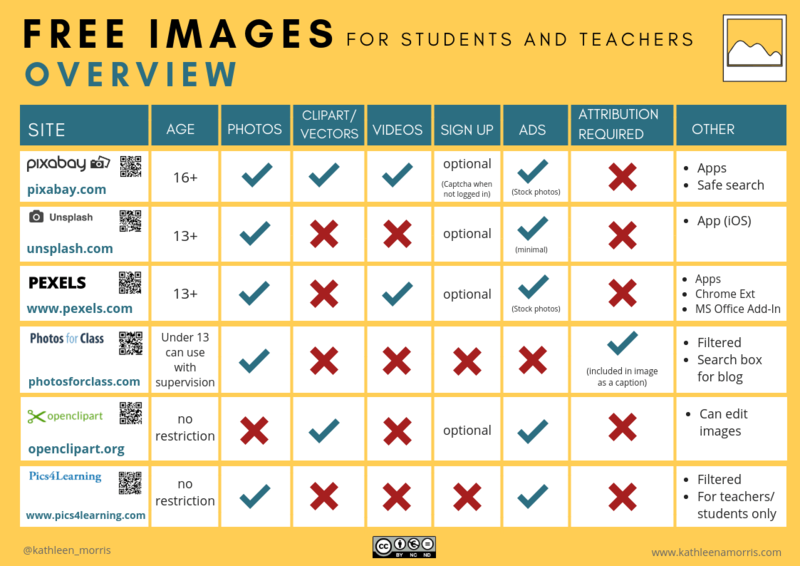 This guide walks you through the process of easily and ethically finding quality images for classroom use. I’ve included a comparison table of different free sites so you can find a resource that’s right for you and your students. 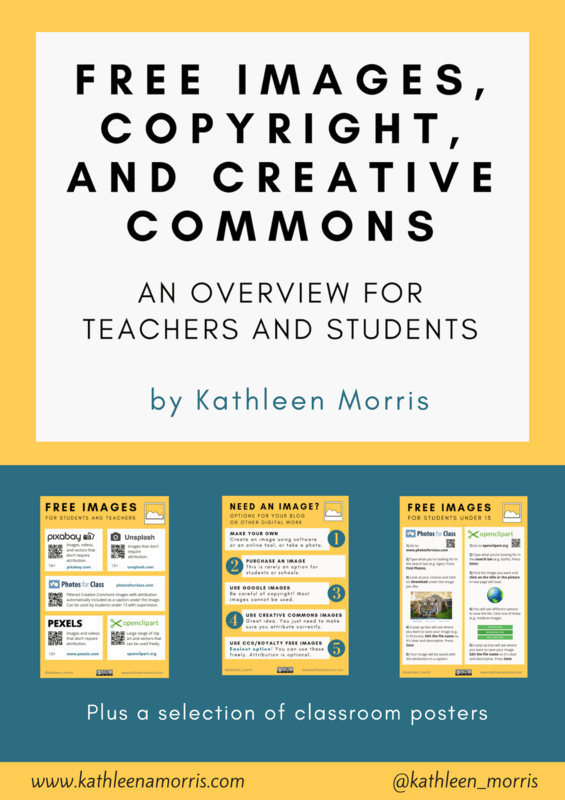 💡 Want a free eBook to learn the basics of copyright, Creative Commons and finding free images? Just enter your email address here and I’ll send it to you. The eBook is an extension of the information in this post plus a number of printable posters you can use in your classroom. Where Do Students And Teachers Find Images? 1) Should students create their own images? This is a safe option. Students and teachers can take their own photographs and/or create images with online tools. 2) Should schools purchase images? We know purchasing stock photography isn’t really an option for students and schools BUT it’s still important to talk about. We pay a hairdresser when we get a haircut, pay a baker for a loaf of bread, so why not pay a photographer for their work? Many businesses pay for stock photos when they need images for their documents, websites, and other work. This is worth students and teachers being aware of. 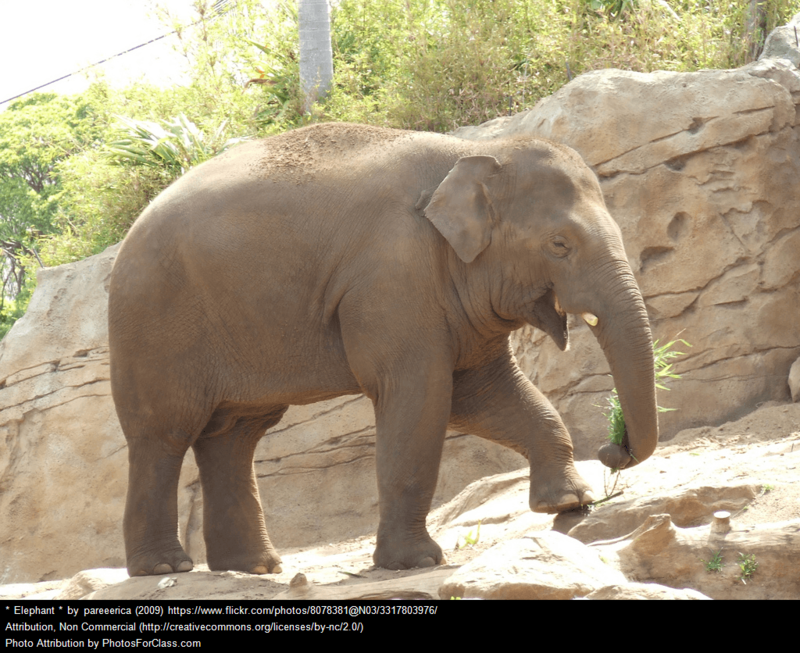 3) Should students use Google Images? From my experience, many students learn how to search and download Google Images early in their schooling. They might pick up this skill themselves or learn it from friends, teachers, or parents. Unfortunately, this is also often the default option teachers fall back on. While this is a quick way to find the image you desire, it’s generally not a good option to rely on Google Images. 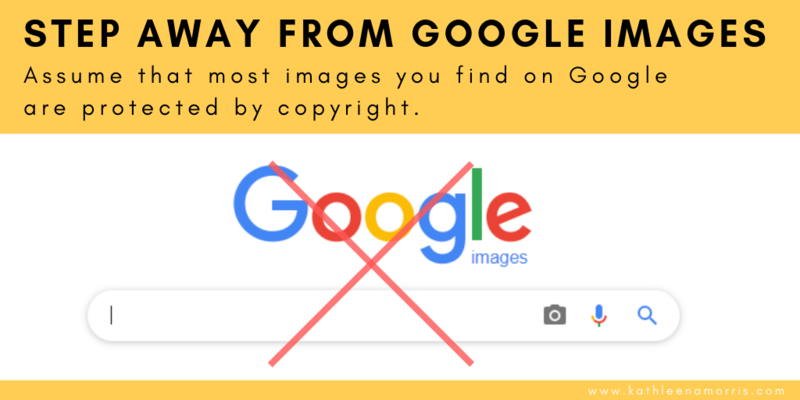 Although you can do an advanced search to find Creative Commons images, most images in your standard Google search are protected by copyright. Even if you cite the source of the image, you are not allowed to use images that are protected by copyright. This is called copyright infringement; it is illegal and unethical. 4) Should students use Creative Commons Images? 5+ years ago I was teaching my student bloggers (aged 7-10) how to source and attribute Creative Commons images for their blog posts and online work. I created a handout to guide students through this process. I plan to update this handout soon! This was a worthwhile task, yet it required a certain investment in time to develop the students’ understandings. There are a number of Creative Commons licenses to understand, not to mention the concepts of locating, saving, and attributing images. Again, going through this process repeatedly can take away from the actual learning intentions for your lesson. Tip: Not sure what the difference between copyright and Creative Commons is? Copyright means the person who took the photo (or created the work) does not allow anyone to use it. Everything that’s published online is protected by copyright by default. Creative Commons means the person who took the photo (or created the work) does allow people to use it IF they agree to certain terms, called licenses. Read more about Creative Commons Licenses. 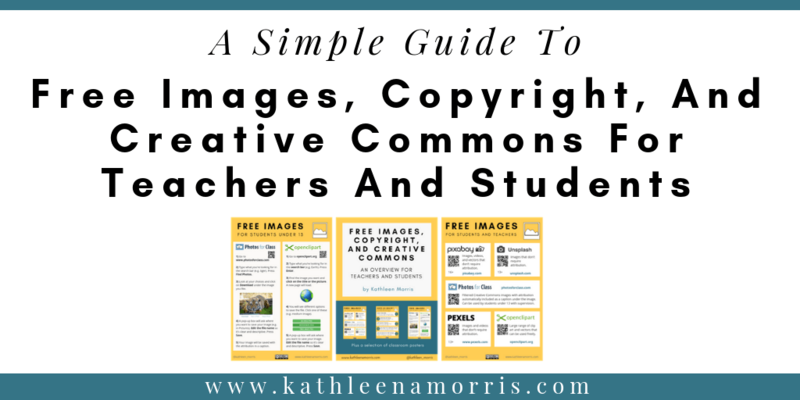 Learn more about copyright and Creative Commons in simple terms in my free eBook. Fortunately, over the past few years, there has been a rise in the availability of free images that are licensed under public domain or Creative Commons Zero (CC0). This is the easiest way to find images for your work. Public domain works can be used freely for any purpose. Their licenses have expired, or they are released with no restriction on their usage. CC0 is a Creative Commons license that allows copyright owners to release their works with no usage restrictions. Some of these sites with CC0/public domain images can be very useful in the classroom, however, they’re not all created equal. All these obstacles can lead back to an ineffective workflow and present obstacles to digital fluency. Let’s break down the best sites so you can decide what will suit you and your students. I’ve curated six useful sites where students and/or educators can search for free images to use without restriction. Scroll down to see a table that compares the features of all six resources. This popular website has a large range of excellent quality images, regularly donated by photographers worldwide. Images can be used freely for any purpose without permission or attribution. The user experience is excellent. The Unsplash website is easy to search and browse. The advertisements are minimal/unobtrusive. There is the option of signing up to join the Unsplash community where you can organise image collections and even submit photos yourself. However, you don’t have to register to download photos. There is an app available for iOS and a Google Slides Add-on. Users are required to be 13 +. A minor interruption to the workflow is that a Captcha image needs to be typed in before downloading an image, unless you’re a registered user. When you’re on the download page some suggested similar images show up from paid stock photo sites. Students would need to be made aware of this so they understand they are not free photos (this could be a worthwhile teaching point: how to distinguish between free resources and paid advertisements). Pixabay does have a SafeSearch option which would certainly be a good option if used properly. Another handy feature is the addition of a Microsoft Office plug-in to grab images for Word and PowerPoint without leaving your document. Users are required to be 16+. Images on Pexels are either sourced from other photo sharing websites, or uploaded by users. Photos can be used freely without attribution. Additionally, there is a free video page, and an app. This site also has the option to sign up but it’s not a requirement. 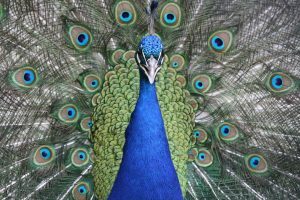 Like Pixabay, there is some suggested content from paid stock photo sites. This service is for users aged 13+. Photos For Class is a good option for younger students. The terms of service state that children under 13 can use Photos for Class under the supervision of a parent, guardian, or teacher. 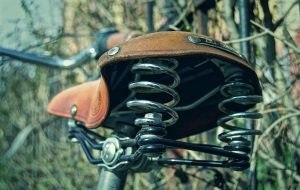 The other advantage of Photos For Class is the images are filtered and age-appropriate. They come from Flickr and Pixabay. I’ve written a whole blog post about Photos For Class as this is really one of the best options around if you have younger students. 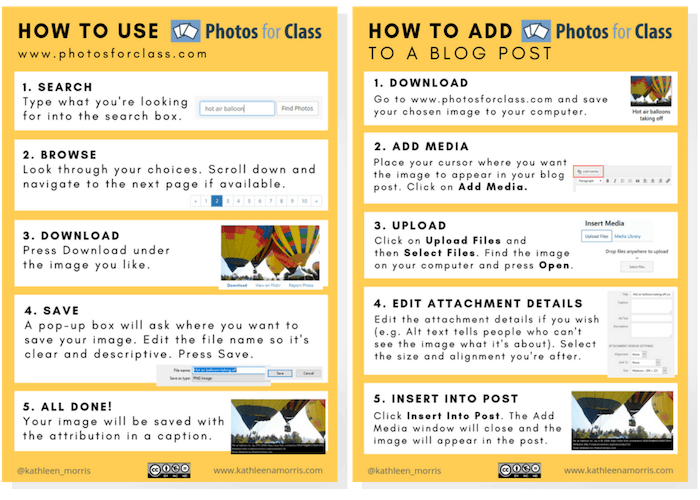 The post includes two posters that explain how to simply download an image from Photos For Class and how to add an image to a blog post. Unlike the three above options, the images require attribution, however, this information is automatically included when you download an image. The attribution appears as a caption below the image. See the example below — the attribution information does appear blurry in a smaller sized image. Another handy feature of Photos for Class is that you can embed a search bar on your class blog or school website like the one below. Clip art and vectors can be useful for students’ creations. Rather than just an attractive image, their work might require a map, sign, icon, or flag etc. Openclipart provides hundreds of thousands of images that can be used freely without attribution. I couldn’t find information about age restrictions on the site, but an email confirmed that this site can be used by students under 13 (it doesn’t seem to be totally filtered so I’d recommend supervision). While Openclipart doesn’t present the most modern interface, it’s easy enough to search for images. There is advertising for paid services on this site which would need to be pointed out to students. Openclipart includes a tool where students can edit clipart. They might enjoy playing around with this feature as you don’t need to be signed in to use it. Images can be downloaded, or you can use the HTML code to embed the clipart like I’ve done here. I added Pics4Learning to my list as a late 2018 addition. I didn’t add it originally because I found the images a little restrictive and amateurish, however, some teachers have mentioned they find it useful. It’s probably an easy option if you teach students under 13. Pics4Learning actually contains “copyright-friendly” images meaning the creator maintains the rights to the image but allows teachers and students to use them. The images can only be used for educational purposes and not commercially. I have created the following table to easily compare the six tools mentioned so you can decide what best meets your needs and your students’ needs. 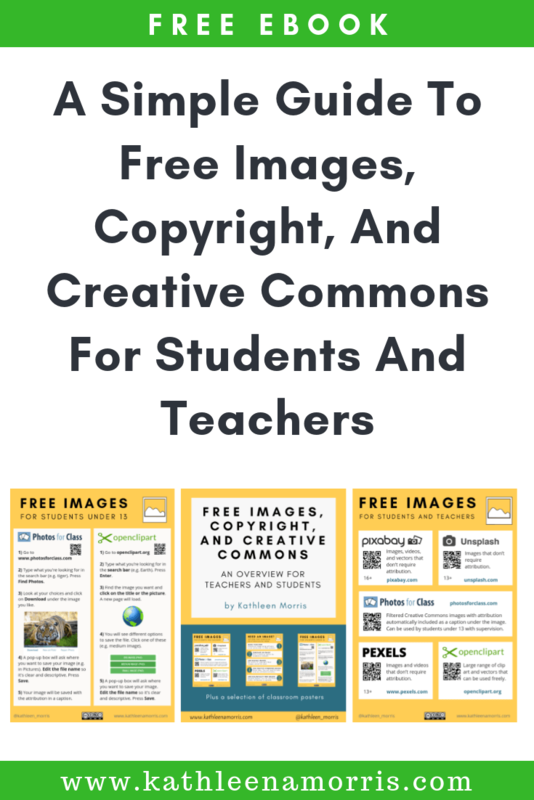 There are a number of issues that can be discussed in the classroom around the topic of Creative Commons and free images. Should photographers and artists give away their work for free? Why are artists and musicians more likely to be asked to give away work for free than professionals in other industries? Why do photographers give away their work to copyright free sites like Unsplash and Pixabay? What are the benefits for them? Who is hurt by copyright infringement? Some free sites have the option to either donate to the artist financially, or publicise their work through voluntarily giving credit or sharing to social media. Should we always attribute, even if it’s not required? 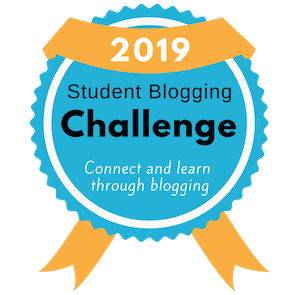 To encourage a discussion on attribution and Creative Commons with younger students, check out this post and video by Linda Yollis and her third grade students. This is an old post by one that Linda still repeats today because it’s so powerful. You might like to try the experiment they conducted yourself. All of the sites I’ve reviewed, apart from Photos For Class and Pics4Learning, are not designed for children. Not surprisingly, some inappropriate content can be found on these sites when you search for it (especially Pixabay and Pexels it seems, although Pixabay does have a SafeSearch option). Photos For Class is designed for children but is not foolproof and relies on the community to help with reporting unsafe images. While I don’t think this is a reason to ban these sites for older students, it’s certainly something to be aware of. Using these resources would just provide an avenue for discussing appropriate online behaviours in an authentic way. Learning about safely and legally finding images online is an important part of digital citizenship. To make life easier in your classroom, I’ve created some free printables which I can email to you. You’ll be able to print them off as handouts, embed them on your blog, or display them as posters. Get the free eBook and posters now! This document walks your younger students step-by-step through the process of finding and downloading an image on Photos for Class and Openclipart. Remember, younger students could try Pics4Learning too but it’s not the most comprehensive site. This document references the five sites that are most useful for teachers and older students. This poster reminds students of the 5 main ways they can find images for their digital work. Most students and teachers regularly need images to enhance their digital work. A clear and simple workflow is required for this process. The skill of legally and efficiently obtaining images is something students need to be fluent in, otherwise, time and focus can be taken away from learning goals. If students or teachers see the process as too arduous, they often default back to using a picture from Google Images. Not a good idea. A little time invested in getting used to sourcing free images can really pay off! 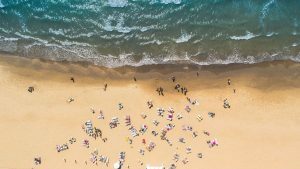 To gain more of an understanding of Creative Commons and copyright beyond images, check out this post by Sue Waters and Ronnie Burt. I also highly recommend Gail Desler’s collection of resources on copyright, fair use, and Creative Commons. It’s important to note that I still think it’s a worthwhile skill to teach students about the full range of Creative Commons licenses and attribution, however, sometimes a shortcut is needed to save time and improve workflows. Public domain, royalty free, and Creative Commons Zero images are a better shortcut than using an image that’s protected by copyright. How do you or your students find images for your work? Do you know of any other useful websites? Please leave a comment and share any tips!